The place where the most cultural diversity can be found is probably the West-Kruiskade. It houses a wide variety of ethnic restaurants and specialized shops. The 600-meter-long pre-war street is located in the city centre between the Kruisplein and the 1e Middellandstraat. Although the meeting function is considered very important here, this is not reflected in the design. There is a great diversity of traffic passing through: pedestrians, cyclists, cars, trucks and trams. The hard surface between the tram tracks makes it possible to pass vehicles when they are unloading, since no loading and unloading places can be found here. The distinct character of the West-Kruiskade, more than anywhere else, is formed by the residents, shoppers and businesses. The old-fashioned street layout does not match this liveliness at all. In reality, the street is designed for cars. The West-Kruiskade was designed as a collection and distribution road for cars and as a main route for trams. This no longer suits the current use, especially for cyclists. Conflicts predominantly occur between cyclists and heavier traffic, since they share the same space. Again, the function of the road is in the network is up for debate. 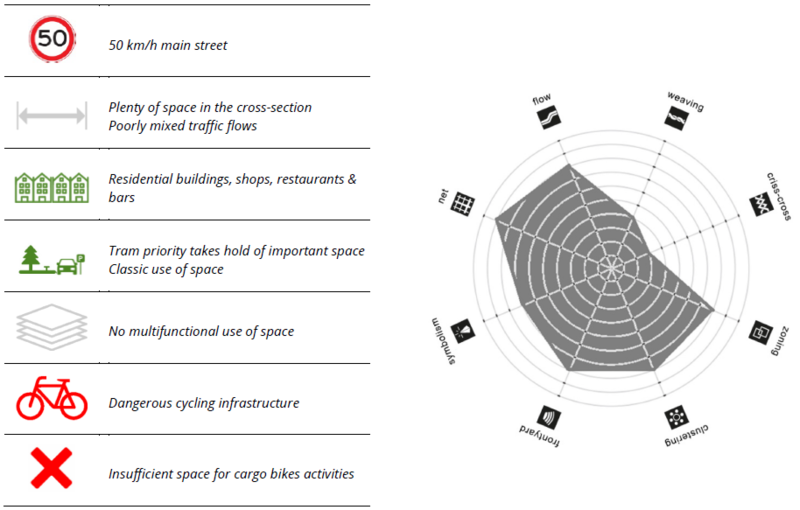 Should it remain a corridor to the city centre or could it become a slow traffic zone, dominated by cyclists and LMV? In the arrangement below, the street keeps its function as a corridor. This means that cyclists must be separated from faster and heavier traffic on a separated cycling lane. The other option, a slow traffic zone, could also improve the quality here, but it would force the ongoing traffic onto other busy routes. 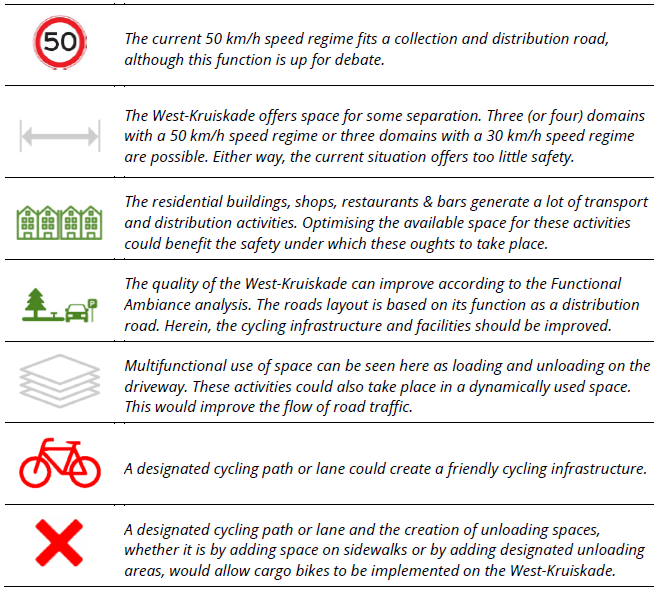 It appears, from the scoring of the quality aspects of Functional Ambiance, that the current quality of the West-Kruiskade is insufficient for cyclists and pedestrians. The allocation of additional space to these two groups could immediately improve the quality. This alteration induces the removal of parking places. A new parking garage under the Oude Westen park could solve this problem and at the same time attract additional consumers. Additionally, narrowing the roadway could slow traffic down so that crossing the road becomes less dangerous for pedestrians. Also, the tram could continue to use its own domain. 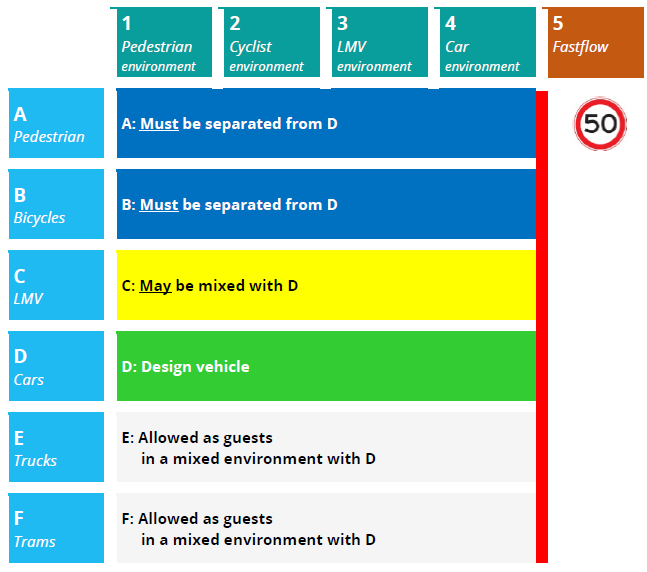 Loading and unloading could then proceed to take place on the driveway, without impeding cyclists. Cargo bikes could then unload their goods on the widened sidewalks.